This past July I had the pleasure of working with a team from Interweave, the folks who publish Stitch magazine, to record a couple of instructional videos right here in our studio in Brooklyn. 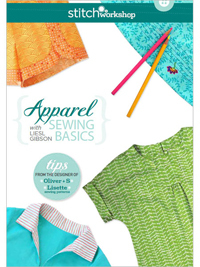 The first of those videos, Apparel Sewing Basics, is now available for purchase as a download (it will be available as a DVD soon, too, if you prefer a hard copy) at the Interweave website. In this video I introduce you to my favorite sewing tools, talk about selecting and preparing your fabric, and show you how to get your pattern ready to sew. Then I demonstrate how to sew curves, corners, gathers and ease-stitches, and edgestitching. I’ve included lots of little tips and tricks that will help you as you sew and as you plan your sewing. The 90-minute video also includes some interviews and other fun bits in between the serious sewing. Here’s a little preview of what you’ll see. I had so much fun making this video! Tricia Waddell, the editor of Stitch, is a real professional and a pleasure to know. We bounced around a lot of ideas and had a great time preparing for the filming. Garrett and Caroline from the production team were fantastic, energetic and enthusiastic. They did a beautiful job bringing everything together. I’ll tell you more about the whole process later, and I’ll let you know when the DVD is available. You’ll be able to purchase it on our website, too.